The HURRICANE, first built by Allied Aviation Corp.(USA), was more than likely the result of excess capacity experienced by many companies after war time contracts ran out. A HURRICANE class racing association was established for a few years on Long Island Sound (east coast USA). Palmer Scott and Co. (builder of boats for many years) purchased a number of bare hulls from Allied, redesigned the deck, added a keel and called it the SMYRA, which existed as a class in Massachusetts for a few years. 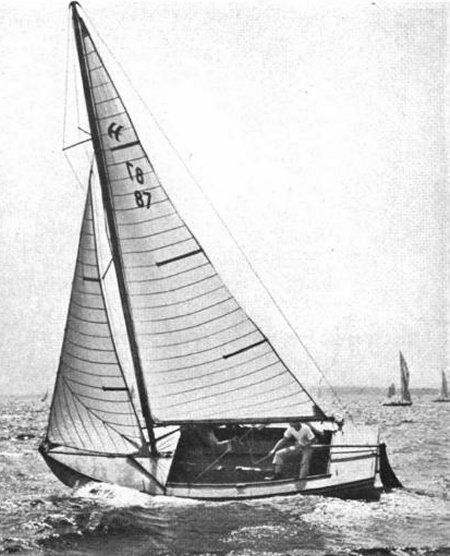 (Some have said there was also a keel version of the HURRICANE) It was from an existing SMYRA hull that a plug was made for what became the RHODES 19 (Rhodes Design #508), first built by Marscot Plastics Co. and later by O''Day Corp..
Philip Rhodes was said to have a very loose policy about royalties paid for dinghies and smaller boats, relying more on their promotional value.